i am musician, soundartist and programer but i live in vienna. my main concern is with sinewaves, their appearance in time and at the threshold of perception, as well as their entanglement with acoustic instruments. as a soundartist i am researching the interplay between sound and light. my software project ppooll is still in use by improvising musicians all over the world. i studied electroacoustics and musicology a long time ago, teach at a university in vienna and was co-curating the reheat festival. Bertrand Denzler is a Swiss musician active in the fields of contemporary improvised music, new music and free jazz. He is based in France and Switzerland. As a tenor saxophonist, he has toured extensively in Europe, North America, South America, the Middle East and the Far East with regular ensembles, dozens of ad-hoc groups, artists from other disciplines (dance, performance, theatre, sculpture, poetry, video), as well as solo. He is or was a member of ensembles like Trio Sowari, Hubbub, Denzler-Gerbal-Dörner, The Seen, Onceim, Denzler-Grip-Johansson. He has composed pieces for new music ensembles and musicians including Ensemble ReRe, CoÔ (Cordes de l’Onceim), Bondi-Denzler-D’Incise, Šalter Ensemble, CCP3, Félicie Bazelaire, Ensemble Hodos, Onceim and Horns, as well as for jazz groups like the Umlaut Big Band. He has also worked as a composer for Swiss filmmaker Christoph Kühn. As an improviser, performer and/or composer, he has participated in over 70 published recordings, released by labels like Potlatch, Umlaut, Confront, Aussenraum, Remote Resonator, Mikroton, Trestle, DDS, Matchless, Creative Sources, Ambiances Magnétiques, Leo, For4Ears, Label Bleu or Unit. 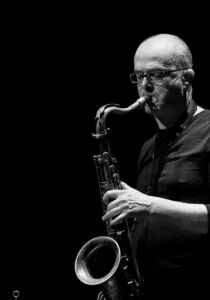 He has published texts about improvisation and experimental music in collaboration with Jean-Luc Guionnet, as well as with Burkhard Beins and Phil Durrant. He also gives improvisation workshops.